Grr. Too many people want to watch Sherlock, iPlayer keeps freezing. Better write a blog post, or I’ll just keep hitting refresh and ruin the whole thing. Unlike the usual chess puzzles you might see in the newspaper (White to play and mate in so many moves), Smullyan’s book contains 50 retrograde analysis puzzles. These are puzzles where you are provided with a chess position and must use pure logic to determine what happened in the past. No skill in chess is required; the only criterion is complying with the rules, no matter how weird the moves might seem. So in this regard they’re more like a sliding puzzle or an intricate lock, with the pieces performing all kinds of strange contortions to reach the diagrammed positions. The nature of the puzzles means there can be an extraordinary variety of questions, including missing pieces, secret promoted pawns, potentially impossible games and invisible kings. The diagram shows a simple example from early on in the book. It’s Black’s move. Can he castle? To solve the puzzle, you just have to work backwards through the various options. If it’s Black’s move now, what was White’s last move? White’s bishops, queen and king are all still locked in place, and the pawns on the second rank have never moved, so the last move must have been with the pawn on a3 from a2. But what about the move before? White must have moved a piece that’s no longer on the board, and Black’s last move was to capture it. White’s rooks never escaped the back rank, so it must be one of the two missing knights. The rook on a8 can’t have captured it, because a knight on a8 would have had nowhere to move the previous turn. At first glance it looks like the bishop on c8 could have captured it, but then White’s previous move would have been with the knight from d6, which is illegal because the king would have been in check for Black’s previous move. Obviously none of the pawns could have taken it. Therefore the knight was captured by the king or the rook on h8. So at least one of those pieces has already moved, and therefore Black can’t castle. Retrograde puzzles date back to at least the 19th Century, and the examples in the book, while original, are all fairly easy. Even the hardest one shouldn’t take long to puzzle through, once you’ve got the hang of the common techniques, which are introduced in the early puzzles. Smullyan’s clever insight is to match the deductive process needed to solve these puzzles with Holmes’ techniques. Holmes and Watson spend the book visiting various chess clubs and country houses, before setting sail to an island with a buried treasure. On the way they solve various mini-mysteries, including a longer plot involving Moriarty. Unfortunately Smullyan isn’t much of a fiction writer, and his Holmes and Watson fall a little flat. The chapter where Holmes recounts a time when he was on the run from Moriarty, solving threats in the form of chess puzzles is sinister and exciting, but a lot of the rest feels like parody without any jokes. It doesn’t help that the solutions are integrated into the dialogue for most of the book, which is both hard to read and difficult to follow, the worst of both worlds. Still, it’s an interesting novelty, and worth checking out if the puzzles sound appealing. There’s also a sequel: The Chess Mysteries of the Arabian Knights. The puzzles are a little harder and more interesting, but the story is even more perfunctory. As an aside, I’ve often toyed with the possibility of writing a sequel. I think the idea is solid, but Smullyan really didn’t have the skill or the inclination to write an interesting story. The beginning sections are too meandering, and the plot about the island is completely throwaway. If I was going to write a follow-up, I’d set it at the famous Hastings Chess Tournament of 1895. It fits in with Holmes’ dates, there were lots of interesting real life characters who took part, and it included one of the most extraordinary games of chess ever played. It’s just at the cusp of when the romantic, sacrificial style of play began to give way to a more thoughtful, analytical approach to the game, which fits in quite well with Holmes and the sort of positions needed for the puzzles. But would a follow-up like that be legal? 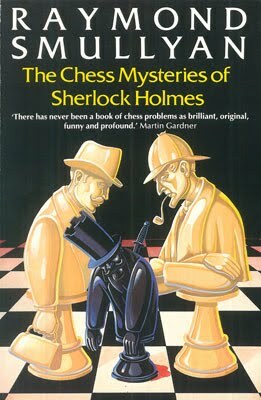 Sherlock Holmes is out of copyright, but would it be infringing on Smullyan’s idea to combine the characters with chess puzzles? Is it possible to use public domain characters in a copyrightable way? Maybe I should just ask Smullyan’s permission. He’s still going strong at 94! Interesting. Ask the guy. I should think he’d give his blessing if you needed it. Have you ever read, The Last Sherlock Holmes Story by Michael Dibdin? If so, what did you think? I’m a big fan of Zen but wasn’t crazy about this effort. No, I’d not even heard of it. From the Wikipedia description (“There’s a twist ending which some reviewers have found to be clever, while others were disappointed”) I assume that Holmes turns out to be Jack the Ripper? There’s an amusing aside in John Sladek’s Black Aura which does a similar thing. In fact, Black Aura (not a Holmes story, the main character just daydreams) might be a good mystery for you to take a look at. It’s VERY tightly clued/plotted, but still has the impression of being written in a loose/chatty style, not too dissimilar to your own. And given his prolific output, I doubt Sladek was in the habit of making hundreds of redrafts. So it’s certainly possible to strike that balance. I don’t know how much time he has left, but I really should send Raymond Smullyan a “thank you” letter for all the fun logic puzzles he has written. He actually makes learning math(s) and logic fun! Is “Arabian Knights” out of print? I didn’t realise. I think the puzzles in that are better (the one about the Master Spy is brilliant), and there are some amusing stories, but some of it feels a bit rushed. I don’t know when my versions were published, but they both have algebraic notation throughout, thankfully. I’ve never been able to get on with the descriptive notation (I never understood why it persisted as long as it did. People were using algebraic notation in the 19th Century! But in the UK the descriptive style was standard well into the 70s, I believe).